Tucked away on Mulcaster Street in downtown Barrie, just a short hop from Heritage Park and the waters of Kempenfelt Bay on the western arm of Lake Simcoe, Pizzeria Italia Restaurant is described by its owners as downtown Barrie’s ‘best-kept secret’. In business for over fifty years – it first opened its doors in 1966 – this eatery has been family owned and run for three generations and continues to lure hungry patrons through its front doors with its wide selection of pies and pasta, as well as its famous homemade bread. Once you fall in love with its food and atmosphere, you keep returning to this little gem hidden down a lakeshore side street. The restaurant is cosy and inviting with an old school Italian mom and pop feel to the interior, which is a little dated and in need of renovation, but most diners ignore the décor and get on with devouring the hearty portions of food. All items are made fresh in the kitchen and available for eating in, taking away or as home delivery. 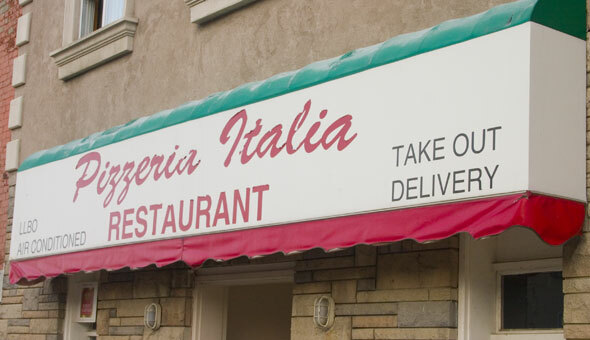 And if you’re planning a party or family get-together, the Pizzeria Italia Restaurant offers a full catering service, so the food comes to you, wherever you are in Barrie. The menu selection is comprehensive, with myriad Italian favourites to choose from, be it a thin crust pizza to take home, an all-singing, all-dancing veal scaloppini marsala or just a simple Caesar salad with house-made dressing for lunch. As well as the Italian staples such as lasagne and cannelloni, you can feast on takeout sub sandwiches with various fillings, folded panzerottis and prime chicken parmigiana, all washed down with one of the soft drinks, liquors or draft beers that Angie and her team have to offer. Pizzeria Italia Restaurant boasts numerous tried-and-trusted family recipes for their pasta, pizza crusts and sauces, meaning more than half a century of homemade cooking is available for what are very reasonable prices given the sizes of the portions on offer. Open from Tuesday to Sunday; Pizzeria Italia Restaurant is a firm favourite amongst Barrie’s Italian-loving foodies, be it for a night out with family in the restaurant itself, a box of takeaway calzones with friends at home, or a piping hot pizza delivered directly to your door. Read a full review of Pizzeria Italia here.